Playing play dough is one of my kids very favorite activities. 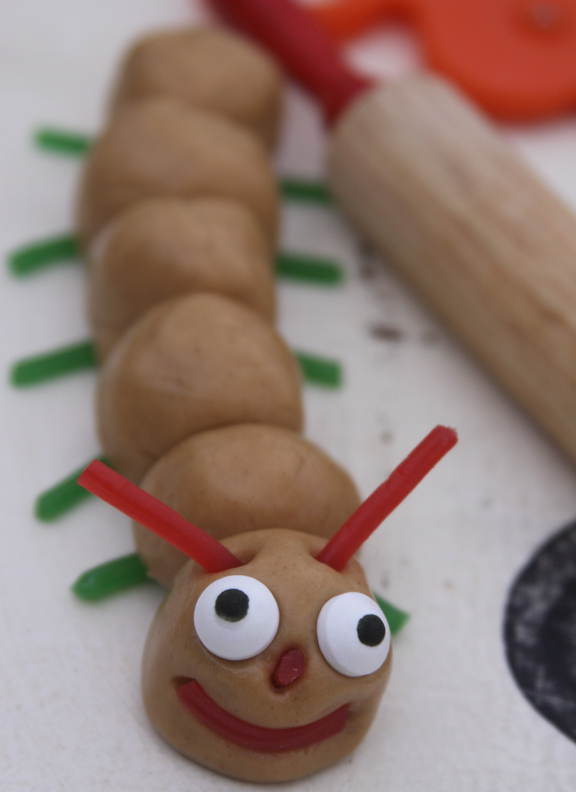 Make the play dough so they can eat it, and you are the coolest mom on the block! When you mix edible play dough with some leftover Halloween candy to decorate it – you get a super fun after dinner treat that will keep the kids busy for hours. Refrigerate for about 30 minutes before Playtime. 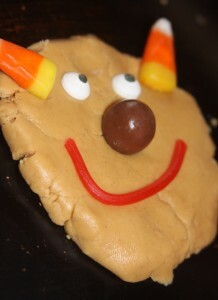 I have tried a few different edible play dough recipes with the kiddos and I think that this one tastes the best. It is super simple and quick to make. You most likely have all of the ingredients in the cupboard already. This is a great rainy or cold day activity to keep little hands busy. We have buckets of Halloween candy right now, so I gave the kids each a few little containers with different shapes and sized candies that they could use to create all sorts of fun things with their play dough. I was surprised at how little they ate – and how much they played. 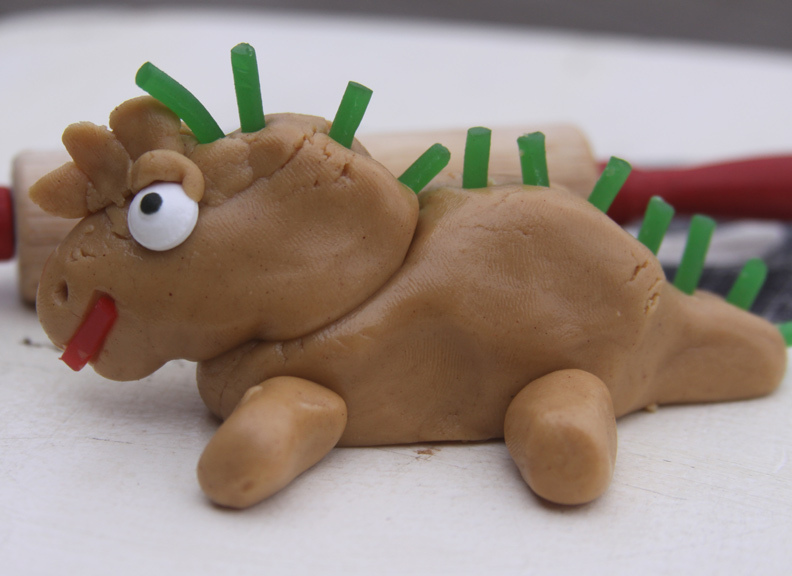 The candy really made playing with this play dough an extra fun and creative process. I made a little caterpillar and dinosaur using pull and peel licorice and some Wilton edible eyeballs. Neither of them lasted long after the kids spotted them! We use our regular play dough toys to help us create our masterpieces. I just run them through the dishwasher when we are done playing. 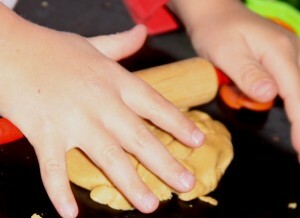 The dough can be refrigerated to save for another day of play as well. Using assorted candy left over from the kid’s Halloween buckets we were able to really have fun creating little animals and friends. M&M candies, licorice, candy corn, whoppers, smarties, chocolate chips, and nerds make great little candy eyes, mouths, hair, and features for play dough friends. Give the kids a variety, and see what they come up with! 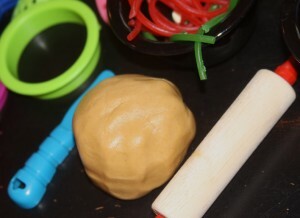 We spent a good couple hours after dinner one rainy evening playing with our edible play dough and Halloween candy. What a great way to “play with your food” in a creative and exciting way for the kids. As the weather gets colder and the snow starts to fly I am gearing up to find activities that keep the kids busy. This is an activity that we will be doing over and over all winter long.